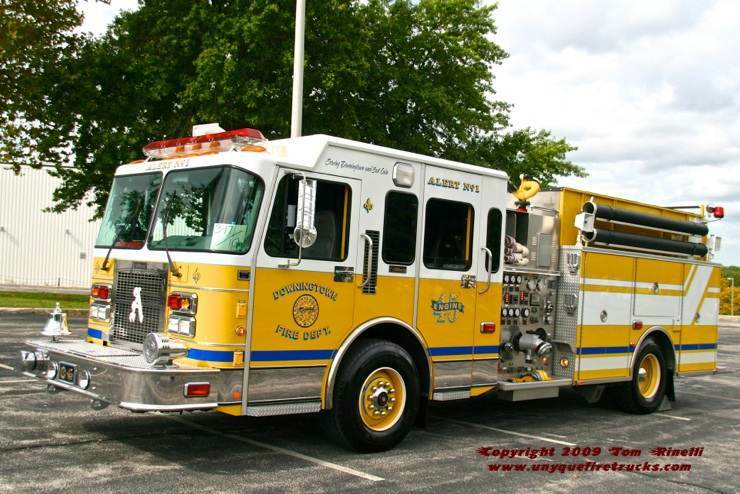 Established in 1887, Alert holds the distinction of being the ninth oldest fire company in Chester County. In true fire service fashion, when their first ladder truck was delivered in December of 1887, the company caught their very first working fire the next night!! 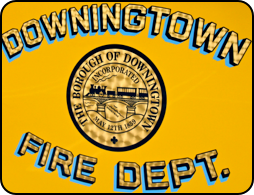 Alert’s volunteers provide Fire, Rescue & Water Rescue services to the Borough of Downingtown and East Caln in conjunction with Minquas Fire Co 2. Featuring an eight man and a 7.5 KW generator, it is equipped with 2,000’ of 5” LDH, 400’ of 3” supply line, 600’ of 2-½” & 1,100’ of 1-¾” attack lines, two portable 1,250 GPM monitors, a thermal imaging camera and an AED. 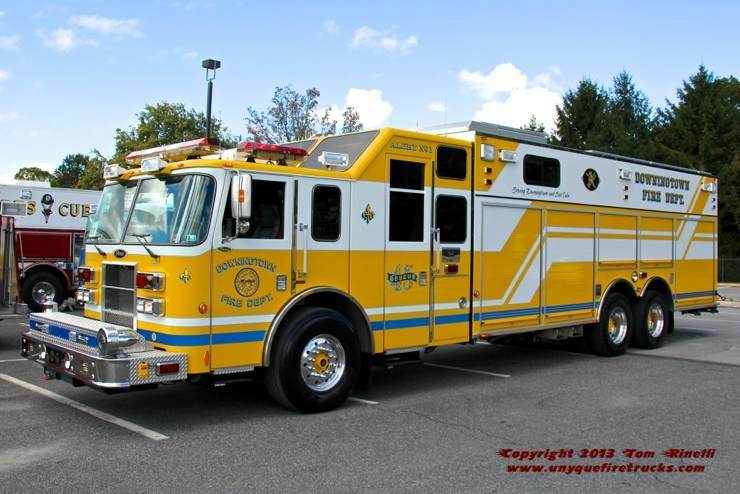 This rig replaced a 1969 Mack CF 1250/300 engine affectionately known as “The Yellow Bird” which was the first yellow fire truck in Chester County. Measuring 42' long, Rescue 45 features an extended four door cab with 22" raised roof, rear air ride suspension mounted on a heavy duty tandem axle and a 25' 6" stainless steel rescue body with deep roof compartments & eleven walk-around compartments with cab operated electric roll-up doors. and an EMS compartment. The Command Area, located in the crew cab has seating for five & has connectivity with the Command Post via intercom, radio, wireless LAN and two 15” LCD flat panel monitors. Rescue 45 is outfitted with a 40kW PTO generator, a 15kW Harrison hydraulic generator, four 200' electric cord reels, twelve 900 watt quartz lights, a 25' light mast with six 900 watt quartz lights, a Warn 9,000 lb. portable winch that can be used on all four sides of the truck, two 150' low pressure air reels and a 16.7 CFM tool air compressor. It is equipped with a complete Hurst hydraulic extrication rescue system, consisting of eight pre-connected Hurst reels (front and mid-body), three Hurst Trimo power units and a Hurst Simo power unit. In addition, it has seven SCBA, a 496 ton high-lift air bag system, low pressure air bag system, Paratech rescue strut system with a capacity to span or support 68', high-lift jacks, thermal imaging camera, multi-gas meters, a full complement of forcible entry tools, saws, PPV fans, salvage and overhaul equipment, portable air cart, ropes/harnesses/rigging for high angle and confined space rescue, hazardous materials equipment, water and ice rescue suits/gear and is AED equipped. 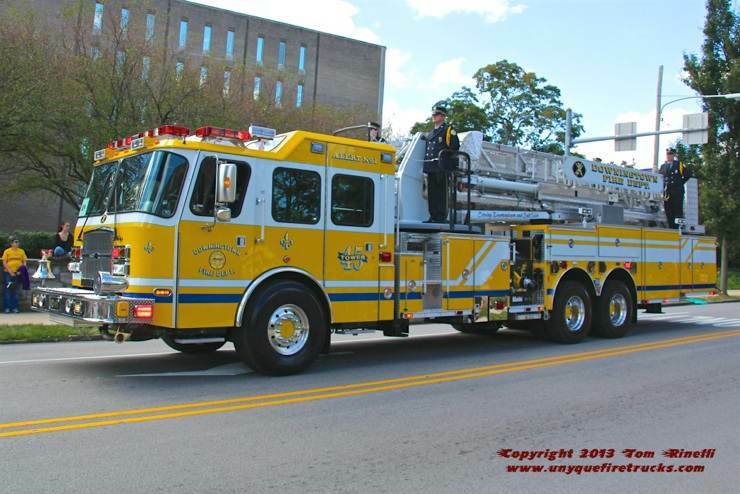 Due to its’ impressive design & equipment cache, Rescue 45 has won many awards at the Pennsylvania State Firemen’s Association Parade including Best Appearing & Equipped Heavy Rescue (2007, 2009 & 2013) and Best Appearing Pierce Apparatus (2009). Tower 45 - 2013 Emergency One HP-95 Cyclone II 95’/2000 gpm/130 gal. Having replaced a 1997 Spartan/LTI 100’/1500 gpm rear mount ladder tower, this rig features a 1,305 lb. rated platform with an 88’ horizontal reach and a 10kw generator. Seating six with SCBA, it is equipped with a 200’ 1-3/4” pre-connect, high rise hose packs, 240’ of ground ladders, two thermal imagers, intrinsically safe PPV fans, high/low angle rope rescue gear, a Stokes basket, an AED and a Hurst e-Draulic combi-tool. 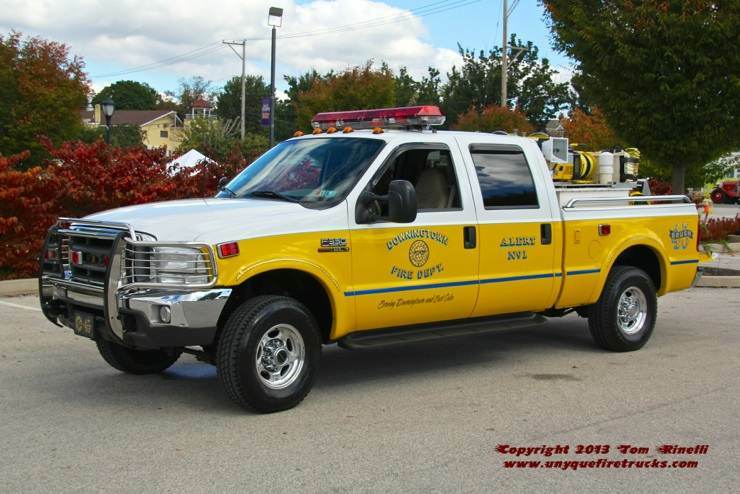 Awarded Best Appearing Brush Truck at the 2011 & 2013 PA State Fireman’s Parade, it features four wheel drive, a custom Darley skid unit and a 2,000 watt generator powering 1,000 watts of scene lighting. It is equipped with 150’ of 1-¾” attack line as well as 100’ each of 1” hard line and forestry hose, “Indian Cans” (backpack pumps) and wildland hand tools. 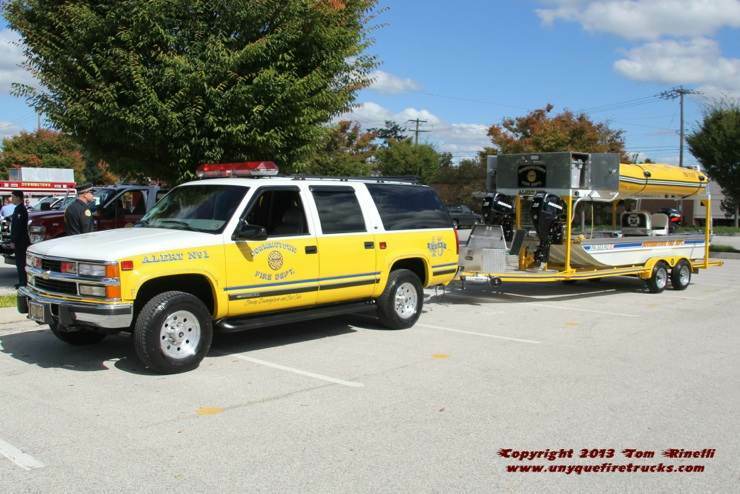 Used for personnel transport, it tows a custom Rescue One double stack trailer carrying the company’s two water rescue craft. The trailer features walk-around decking, equipment storage compartments, two 25HP Mercury propeller style motors (for Boat 45-2 & a dedicated spare), emergency and scene lighting as well as rope, webbing and hardware for a line system. Outfitted with a 40 HP four stroke Mercury jet style motor, it features a bow dive/rescue platform, center console mounted high band/marine/weather radios, depth finder and a stern mounted lightbar with eight fixed and oscillating LED search lights. It is equipped with PFD’s (rescuer & victim), throw bags, rope, telescoping marine hooks and a flare gun kit. With a rescue complement closely mirroring Boat 45-1, it also carries assorted portable equipment including a marine/weather radio, waterproof lights and watertight radio bags.